For the extension of the Reynaers Aluminium headquarters, Jaspers-Eyers Architects were commissioned to design a sustainable building in which the key focus would be on innovation as well as the comfort of visitors and users. The new Experience Centre fits perfectly with the existing buildings and is a fine example of architectural use of aluminium façade and window systems, where the interplay of light and space is at its best. For the new headquarters, that has four storeys with a total floor area of 3,500 m², the architects opted for a design where the appearance of the front and rear façade was entirely attuned to their function. The two façades are very different, yet are in harmony with the overall concept. The front, which faces the street, is characterised by a pronounced stark pattern of aluminium façade and window systems. The concept fits in with the existing buildings due to its 'less is more' philosophy, but has an iconic appearance through its ingenious projecting window and façade elements. The linear pattern of the façade on the street side gives it a surprising three-dimensional appearance. The client and the architects have literally showcased the numerous innovative possibilities of Reynaers Aluminium systems. Unlike the front, the rear façade is a strikingly opened-up building and creates the access to the spacious entrance hall. The rear façade has a markedly playful and transparent architecture due to the varied interplay of projecting vents with terraces and façade-wide aluminium window systems, without any concessions in terms of tightness of the design. The top floors of the new headquarters building consist of open-plan workspaces for the employees. The lower two floors are structured around the central atrium with an auditorium, an experience room and Avalon, the Virtual Reality room. With these facilities, Reynaers wants to underscore its role as a pioneering innovator in the digital era. For the design of the façade, the CW 60-SC (Structural Clamped) system was used. This façade system has excellent thermal performance, and is ideal for the large, heavy expanses of glass that characterise the design. The glazing is invisibly clamped to its supporting structure. 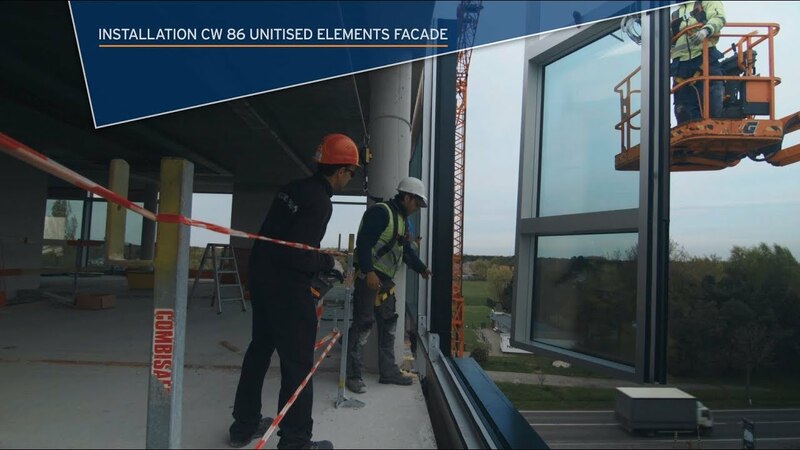 On the other hand, the CW 86-EF/SG (Element Facade Structural Glazed) was installed as a custom solution. In this cassette façade system, the elements are pre-assembled in the factory, together with the glazing. The system with structural glazing enables the opening sections (parallel opening windows) to be incorporated seamlessly into the whole, and allows the motors for the electric window operation to be concealed. Watch the below movie to learn how the façaced was fabricated and installed. The minimalist Hi-Finity sliding window system is integrated into the façade structure of the rear façade. With its elegant design and large area of glass, the Hi-Finity fits perfectly with the chosen façade systems, and reinforces the tight and transparent image of the building. The BS 100 solar protection system on the right-hand side of the building creates a playful effect for the tight design of this volume, and offers additional comfort for the offices situated behind it. From now one, the site in Duffel will be known as the Reynaers Campus and offers to architects, clients, project owners and other partners the experience and the infrastructure that meet their requirements. Numerous facilities were developed to bring people together and inspire them with innovative technologies for architectural building solutions. The Experience room goes far beyond the classic showroom concept. A large number of inspiring digital applications complete the experience. For an exclusive, enthralling experience, as a construction industry professional, you can visit AVALON, the Virtual Reality room that has been specially configured for architectural applications. The auditorium accommodates 100 people and facilitates the holding of both internal and external seminars and events.